Recently I heard whispers about a frozen yogurt spot opening in the area and I got pretty excited. You see, I can’t actually remember the last time I had soft serve frozen yogurt but it was at least two decades ago, so it was about time to break the dry spell. Truth be told, I was a little bit jealous of the Cincinnati area as they seemed to have more than their fair share of creamy delicious frozen yogurt type treat spots while we in Northern Kentucky had pretty much zilch. All of a sudden Orange Leaf appeared on Mall Road in Florence and balanced the universe with some seriously delicious frozen yogurt goodness! I’ll be honest, I’ve never been to a frozen yogurt place quite like Orange Leaf. It took a minute when we first walked in to identify what exactly the deal was, but my family and I caught on quick!! We were greeted by an employee who offered us samples of the different flavors of the day…Um, yes please! Once you’ve tasted the goodness and have settled on a flavor (or three) grab your cup and get to work. Just at a glance I saw brownie batter, wedding cake flavor, coffee, cheesecake, cookies and cream, and straight up plain old vanilla or chocolate and that’s just to name a few. The flavors change every day so there’s always something new to try! Everything is self serve and the cups are quite large… you might be tempted to fill that baby up to the top with frozen yogurt and get down to business but don’t be too hasty, there are toppings to be had as well!! Once you have your yogurt head over to the topping bar… OH so many toppings! Fruit and candy of every kind are ready for the scooping… I chose some Junior Mints and cookie dough bites this time around, my youngest is more of a fruit flavored candy type though and he ended up with gummy bears, little fruit bubbles and Skittles. My oldest is a purest… chocolate sauce and sprinkles only, thank you. The combinations are endless! Once you’ve covered every inch of your frozen yogurt with your toppings of choice, head to the register and place your cup on the scale where it will be weighed… that’s right, you pay by the ounce!! It was 46 cents per ounce while we were there and worth every single penny! All in all it was a great treat for my family and everyone got exactly what they wanted!! 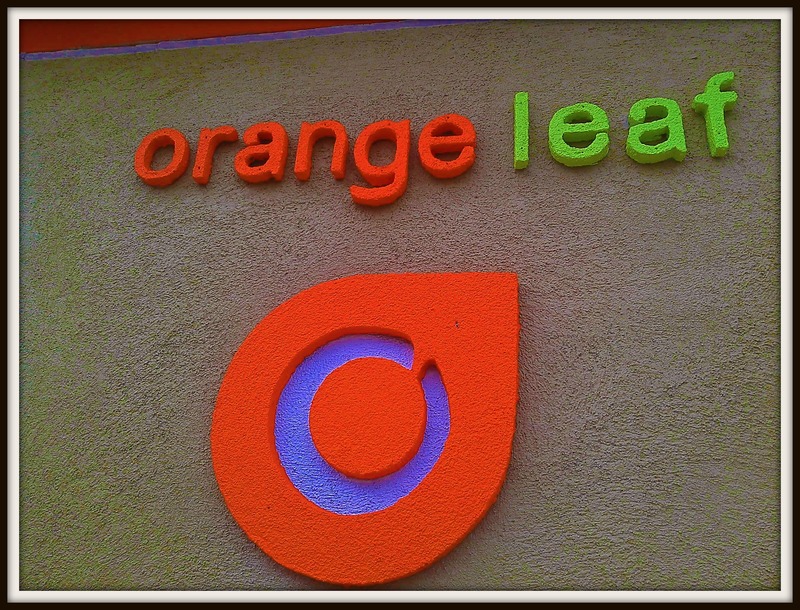 You can find all of the Orange Leaf locations on their website…they are situated all around the Cincinnati area and I’ve even heard they will have a new location that will be opening at the Banks!! Like them on Facebook for updates on flavors and specials! And make sure you try the brownie batter while you are there…Oh my goodness, delicious! I love Orange Leaf! Sent my husband on a “treat run” last night to their Florence, KY location for the family. He had never been so I said – any flavor will do, they are ALL great! Armed with these simple instructions, he calls me to say “why is there a line wrapped around the building?”. It is that good people!